Regular visitors to this website know that, despite the fact that it's not my favorite genre, I find myself watching a lot of biopics and films based on a true stories. And I have a firm belief concerning these films -- there needs to be a rule that they must contain either a special feature explaining which parts of the story are true or "Pop-up Video" during the film which points out the factual moments. There is nothing worse than coming away from one of these films and immediately having to do online research to find out what really happened. The historical drama A Little Chaos frustrated me at the outset, as it opens with this message: "There is an outdoor ballroom in the garden of Versailles. In what follows, that much at least is true." That's all that they know? This is going to be a bumpy ride. A Little Chaos opens in 1682 as King Louis XIV of France (Alan Rickman) has ordered the construction of Versailles, a massive palace. Andre Le Notre (Matthias Schoenaerts) is overseeing the planning and construction of the gardens. Louis has ordered that an outdoor ballroom be built. Le Notre has fielded design ideas from experts throughout the country and he requests a meeting with Sabine De Barra (Kate Winslet), a widow who loves gardening and landscaping. At first, Le Notre deems Sabine's designs too wild, but he reconsiders and hires her for the job. So, as unheard of as it was, Sabine found herself in the midst of a construction site, ordering men to construct the daunting structure. However, Sabine is not prepared for how her new role will thrust her into society and she's equally unprepared for the political games which are played there. So, with A Little Chaos we have a story which may or may not be true? A small bit of research tells us that the outdoor ballroom was real, and that it can still be viewed today. We can also learn that Andre Le Notre was a real person who designed the gardens of Verailles. So, it would appear that the part which is not true, or at least isn't supported by any research that I could see, is the part concerning Sabine...or most of the movie. There are no extra features on the Blu-ray Disc (I swear, it should be a law), so we don't know where the idea came from or if it's based on some person from history. It can be assumed that Le Notre received assistance from one or more people while designing the gardens, and what a fun flight of fancy to make it a woman, but what is the real story here? 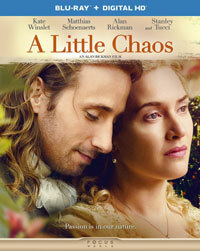 OK, so that aside, A Little Chaos is an interesting little film. The movie was Co-written and Directed by Alan Rickman, and is the first film which he's directed in 17 years. I didn't know that he was behind the camera going in, but in hindsight, it makes sense, as the film has a slow, leisurely pace which matches the clip at which Rickman speaks. The film, which has a running time of 117-minutes, takes its time in setting up its premise and certainly lets the story unfold at an organic pace. This does give us time to get to know the characters and, for once, keeping track of all of the various royals are only slightly confusing. While the film is not without its charms, it's clear that Rickman and writers Jeremy Brock and Alison Deegan have trouble drawing drama from the story. There is little suspense over whether or not Sabine will get the job, as there wouldn't be a movie if she didn't. There is romantic tension between Sabine and Le Notre and a scene of sabotage, but these moments simply happen and the movie doesn't try hard enough to make the audience feel something from them. The film fairs much better with lighter emotions. Stanley Tucci appears playing himself as usual, as he stills the show, bringing some much-needed levity to the proceedings. The film's best moment comes with a very gentle and subtle meeting between Sabine and Louis XIV. One gets the feeling that A Little Chaos may have been a pet project of Rickman's but the elaborate costumes and sets suggest something somewhat bigger. The result is a film which falls somewhere in between. It certainly has the grand scope of an epic, given the palaces and gowns involved, but the film lives for small quiet moments between the characters. Winslet is excellent of course, and Schoenaerts holds his own against her. Again, Tucci steals the show and Alan Rickman is Alan Rickman. I think that any interested in French history may find this interesting, as will those who enjoy historical dramas which have a touch of romance. But, be warned, this is not a "bodice ripper" and the chaos of the title is merely implied. A Little Chaos is the first movie about a garden that I've seen in...ever on Blu-ray Disc courtesy of Universal Studios Home Entertainment. The film has been letterboxed at 2.35:1 and the Disc contains an AVC 1080p HD transfer which runs at an average of 33 Mbps. The image is very sharp and clear, showing no overt grain and no defects from the source materials. As the film contains many flowers, Rickman has paid particular attention to the colors, which look great and the image is never overly dark or bright. The level of detail is good and the depth works well. The Disc carries a DTS-HD 5.1 audio track which runs at 48 kHz and an average of 3.8 Mbps. The track provides clear dialogue and sound effects. Being a historical drama, we don't get an abundance of wild effects here, but the stereo effects work well, most notably in the garden. There is a scene which takes place during a storm, which provides some mild subwoofer action, as the rain fills the rear speakers. There are no extra features on the A Little Chaos Blu-ray Disc.